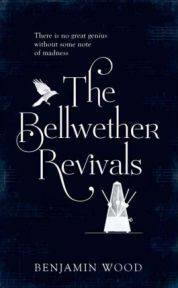 “There is no great genius without some note of madness” runs the strap line for The Bellwether Revivals, an entertaining first novel with some dark undertones by Benjamin Wood. The story is told mainly from the perspective of Oscar Lowe, a clever but uneducated young man working as a nursing home assistant in Cambridge. Oscar falls in with a close knit group of privileged students which includes Eden Bellwether and his sister Iris, and gradually becomes part of their circle. Oscar forms a relationship with Iris and Eden provides the genius with a note of madness; from the beginning it is clear that things are not going to end well. Eden is an extraordinarily talented musician, and believes in the power of music to manipulate emotions, something that most people would ascribe to. However, his belief has gradually extended beyond that so that he now believes that through music he can physically heal people who are unwell and is looking for opportunities to demonstrate this. Oscar enters Eden’s world at a key moment, and becomes inadvertently an element in Eden’s experiments. Oscar becomes increasingly convinced that Eden is unstable and in turn tries to understand what underpins his behaviour and beliefs, roping in American psychologist Herbert Crest who just happens to have an incurable brain tumour. There is much talk of narcissistic personality disorder (readers can judge themselves against the diagnostic criteria! ), but for most of the novel it is unclear whether or not Eden has some supernatural or magical ability – “The irrationality of a thing is no argument against its existence”, to quote Nietzsche. Overall I enjoyed this book, without being completely engrossed. The behaviour of some of the characters appeared unconvincing to me and the way in which they spoke jarred a little, Eden’s father Theo (a surgeon) being a key example. Nonetheless, The Bellwether Revivals provides an interesting portrayal of a dysfunctional family and kept my attention well as the plot moved along with good momentum. The origins of Eden’s behaviour were hinted at (a childhood experience of a religious revivalist meeting in Florida, and an experience with a blackbird), but never really explained. I would have liked this to be developed a little more. However, I think that Benjamin Wood is a young writer who is well worth watching and I will look forward to his future books. No Comments on "The Bellwether Revivals"